Bolt maker is a specific purpose machine, mainly used for making bolts of various sizes. The process of making a bolt is simple. The raw material wire is used for making bolts. It is cut to a length of finished bolt and also creates bolt head. A thread is rolled on a bolt's blank shank. A bolt generally has a hex head and for making it, the edges are trimmed. 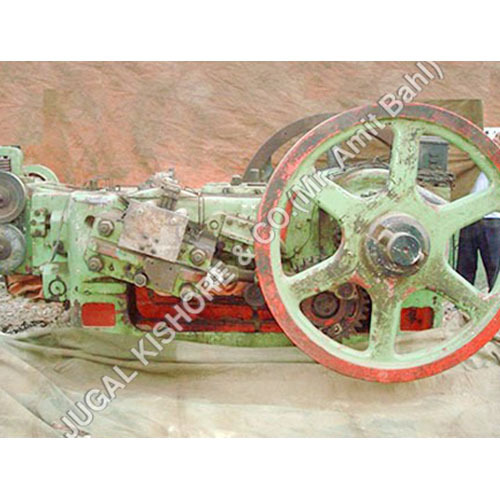 Jugal Kishore & Co., an international trader deals in n number of models of both, new and used bolt making machine. Bolt Maker National 16MM is one of these models. The buyers can come to us with their application requirements and our personnel can help them select the right bolt maker to suit their application. The selection process include points, such as number of dies, the size of bolt to be manufactured, the capacity of the machine and motor power. The clients into the business of manufacturing fasteners can contact us for buying bolt maker. If they do not have enough capital to invest in new bolt maker, then they can buy a used bolt maker. We assure that we provide bolt maker in good condition, not only from outside, but also inside.